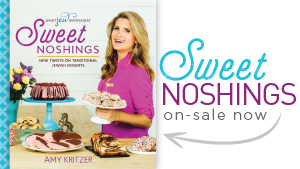 The countdown is on- it’s almost Passover time! Who’s excited? This girl. 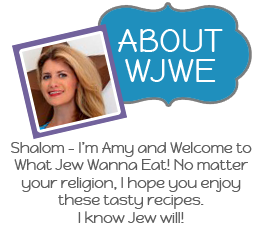 If Jew are catching up on your WJWE, I made an easy gefilte fish video last week with my friend Hilah and was a featured blogger on Joy of Kosher! Busy week, y’all! 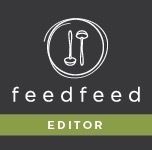 Last year I shared my recipe for traditional charoset– and it was delicious. My gentile friends even ate it up! This year I stepped up my game with the addition of beets (say what? ), dates (crazy!) and candied walnuts (mmm, sugar) to make Apple Beet Charoset. All without sacrificing the necessary wine. Well let me pat myself on the back- this version is pretty darn tasty! 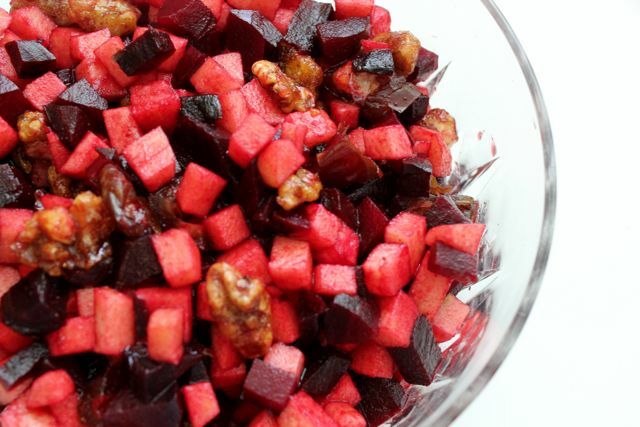 The healthy beets balance the other ingredients and add an awesome red color to the mix, and the dates and candied nuts just sweeten the deal. And by deal I mean charoset. Here is all Jew need to get started! First up, let’s sugar some nuts! Bake the walnuts in a single layer in a preheated 350 degrees F oven until toasted. Next up, put your 1/2 cup sugar in a saucepan on medium heat and mix while melting the sugar. 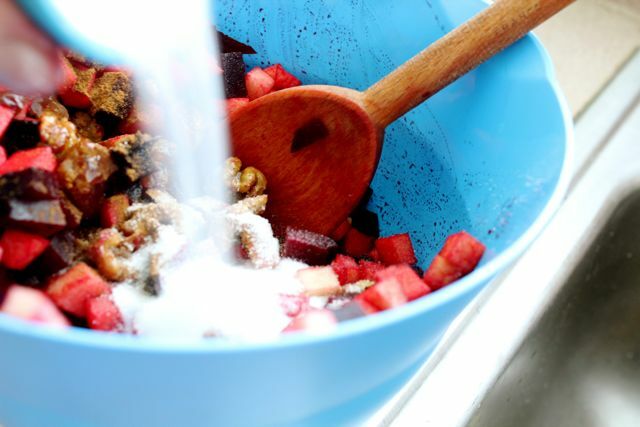 As soon as the sugar is melted, add the nuts and quickly coat the nuts. This happened so quick I didn’t have time to photograph it! Transfer nuts to piece of wax or parchment paper and immediately break up the nuts with spoons. 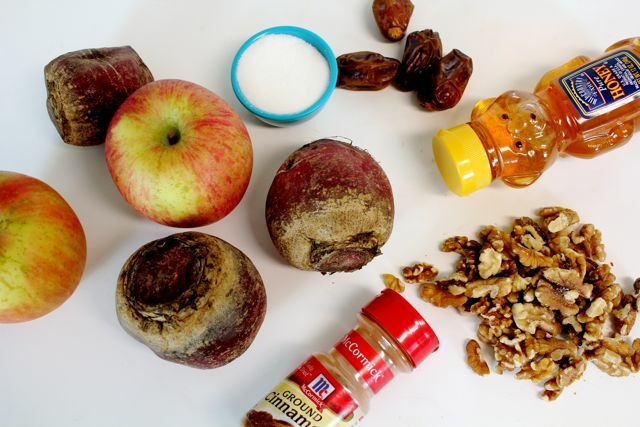 Peel your beets and peel and core your apples and dice ’em up. The beets are already making our apples a pretty shade of pink! Then add the diced dates and cooled nuts. And then the cinnamon, honey and wine and mix one more time! That’s it! How pretty is this? 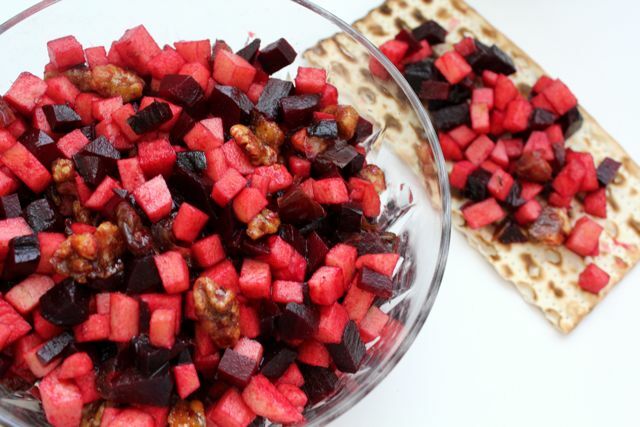 Besides during the Seder, I like to serve this over yogurt for an easy kosher breakfast. This can totally be made ahead of time- and the longer it sits the redder it gets! 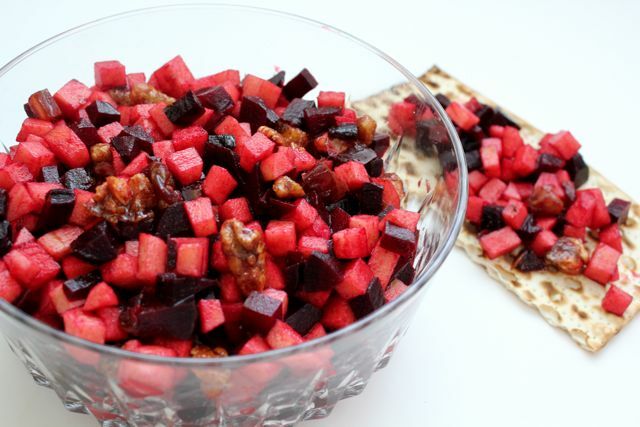 An alternative to traditional charoset for Passover with the addition of beets, dates and candied walnuts! Preheat oven to 350 degrees F. Set aside a piece of wax or parchment paper. 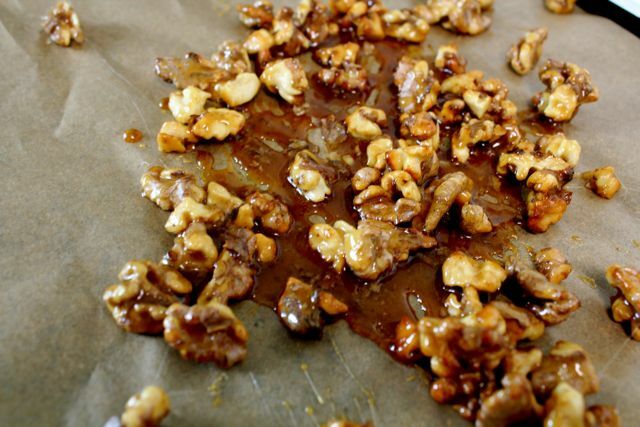 Place walnuts in a single layer on a foil lined baking sheet and bake until toasted, about 5-7 minutes. 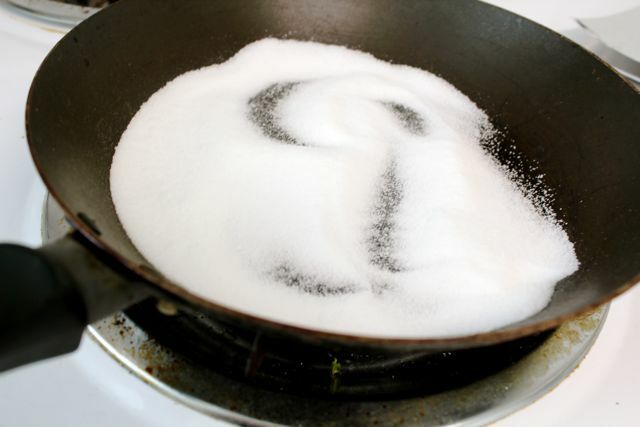 Place ½ cup sugar in a medium saucepan on medium heat and mix while melting the sugar. As soon as the sugar is melted, add the nuts and quickly coat the nuts. Transfer nuts to piece of wax or parchment paper and immediately break up the nuts with a spoon. 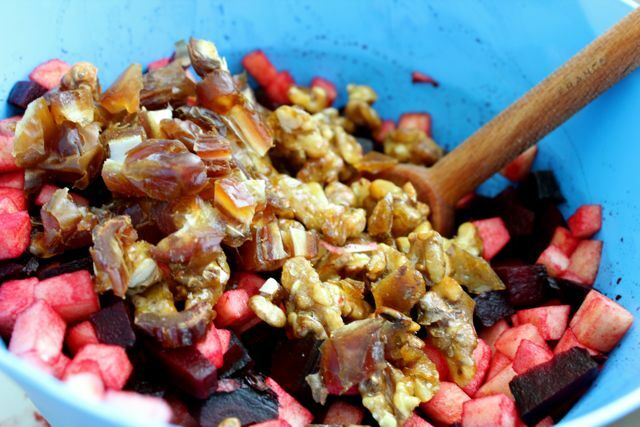 After you make your nuts, get those beets cooking! 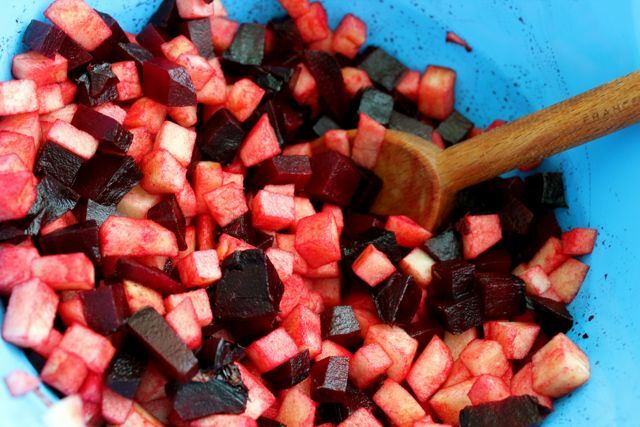 Toss beets in olive oil and salt and place on a foil lined baking sheet. Roast for 15 minutes or until tender. Let cool. 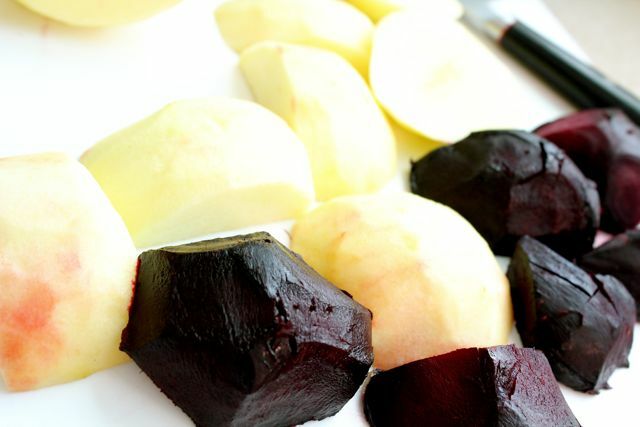 Peel and core your apples and dice them and toss with beets in a large bowl. Then add the diced dates and cooled nuts. Then add cinnamon, honey and wine and mix one more time. Beets can be cooked ahead of time. 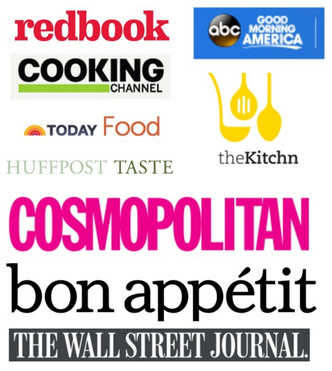 « Gefilte Fish Guest Video on Hilah Cooking! Love the idea of putting this on yogurt! Sounds delicious. Mama Mia – This is THE BEST Charoset I have ever seen in my 8 decades here on earth. You are the bomb my little granddaughter. Can’t wait to spend some quality time with you at the Seder! Thanks, Bubbe! You don’t look a day over 60. Can’t wait to see you too! Just wondering…would this work with canned beets? I haven’t tried but I don’t see why not! Fresh taste better though. I’ve also seen these vacuum sealed beats that are basically fresh but without the work. Those work be a great option too to save time! 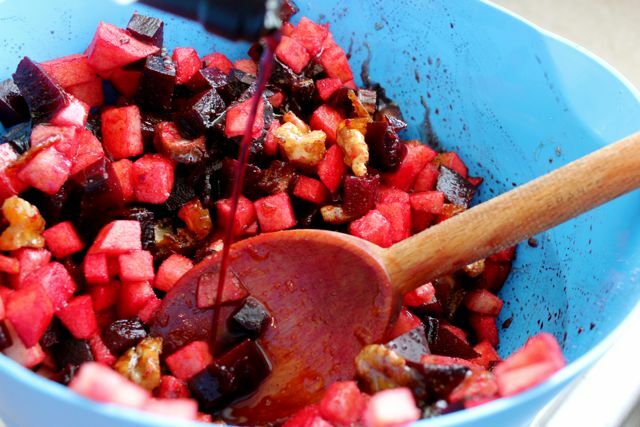 I would be careful on the canned beets that they have no vinegar/acid in them, I think an acidic or vinegary taste would ruin the honey and wine dressing. Can you find frozen? or pre-cut at a store like Whole Foods or Trader Joe’s? Thanks for the tips ARuth (I’m ARuth too!) At my supermarket they have pre-cooked ones that are fresh. You can microwave beets too to save time. Amy I can’t thank you enough for the recipe; it was absolutely delicious! I made this for my Monday night Bunko and had the gentiles going gaga over it. Happy Passover! Yay! Great to hear. 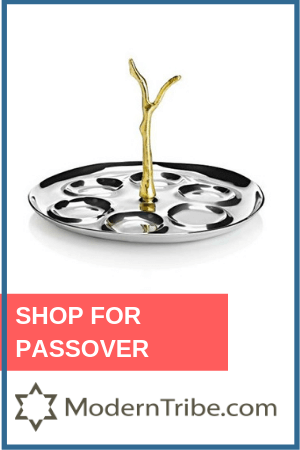 Happy Passover to you! This is beautiful. One thing I might have done differently was actually peel the apples – as your recipe did say to do. We usually don’t peel our apples for charoset, so I didn’t for this, either. It isn’t taste or texture that bothers me, but there are a few places where the peel of our Jazz apples is a bit yellowish-pinkish and it shows through the lovely red of the rest of the dish and I’m disappointed in that – my fault. But. Really interesting combo and can’t wait to share with the relatives! Huh I always peel my apples for charoset. Never thought of not! But glad you liked it! Haha awesome! I love how the beets turn everything pink. Look for some new bread-y recipes soon! We LOVED this. Modifications – used an organic tart cherry juice (which included pear and apple) with a splash of orange juice instead of the sweet wine (had childhood memories of that stuff). Cut the honey back by half (and even that was not necessary). Next time I will roast the beets whole and then cut; will replace red with orange (staining on peoples clothes). and in the summer I can see making it with peaches instead of apples. It was eaten like a veggie at dinner last night – and we had the leftovers with greek yoghurt for breakfast. AMAZING.